Since my last post about this UFO, eight months have already passed... and only four blocks more... a shame! My goal for fall was to finish it, so that's what I am trying to do right now. I took all the stuff from its box, hanged the unfinished and crumpled top on the design board, and let's star! I have been knitting a lot recently... not very eager to start the UFO's finishing job! 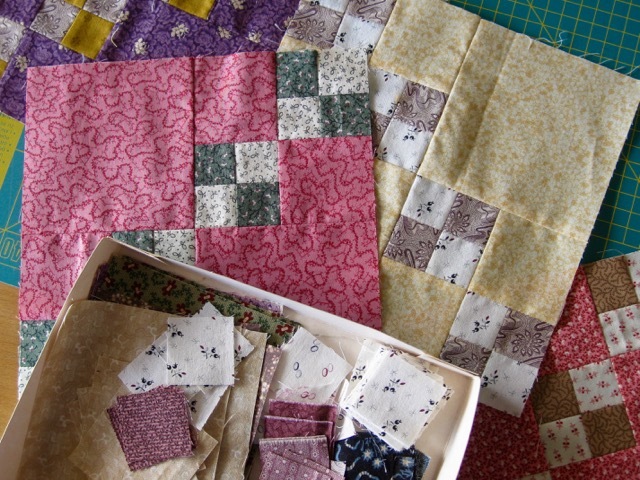 But this week-end will be quilting! The weather is not hot anymore... no excuse anymore! Il est frais et lumineux! C'est définitivement sur ma liste de projets. Oui,une veritable honte que ce si joli patch ne soit pas encore fini...:) alors,bon courage pour les derniers blocs et on attend le final. Un projet possible pour moi aussi...un jour...vu que ce ne sont que des carres ! It is beautiful. I know you'll be so happy to have it finished. Your Double 4-Patch takes my breath away. It's one of my favorite patterns and your quilt is a quite a stunner!! Have fun with BROWN month for the Rainbow Scrap Challenge... although, I'm still not certain how these blocks will fit into my quilt. I love how light and airy it is. It will be worth the effort once you are enjoying it! I like this quiltpattern very munch and intend to make one myself. Your quilt is beautiful. Avec de si jolis tissus, je pense que tu n'auras pas de difficulté à t'y remettre. 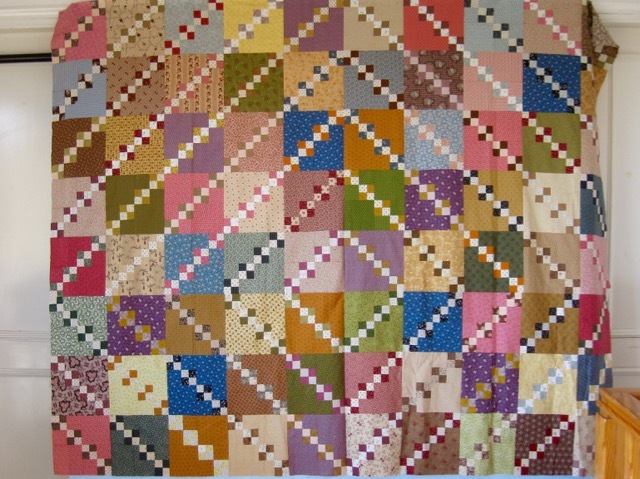 Très joli quilt. Bonne continuité. What a beautiful quilt and lovel blocks. Oh it's a beautiful design Christine. 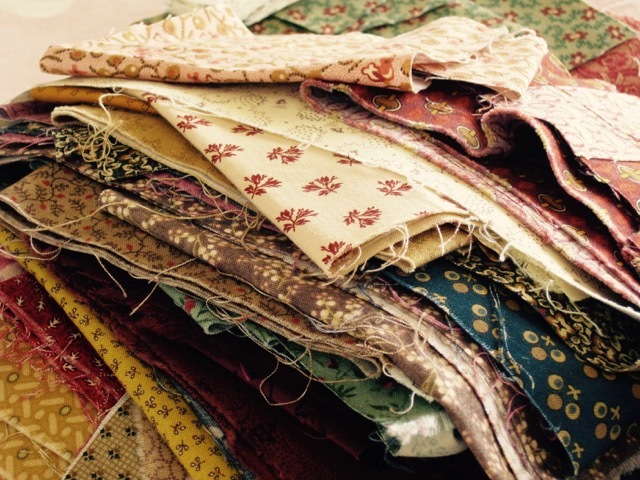 I'm sure you'll get it finished with that scrumptious pile of fabrics to choose from. I ADORE your double 4-patch - it's on my to-do list - hopefully sooner than later - and I hope it turns out as nicely as yours! I have always been fond of this particular pattern and you have used beautifully soft tone fabrics - perfect! Christine, ce n'est pas grave si tu mets du temps à terminer ce si joli quilt !! Tu as eu d'autres priorités depuis.....Il est magnifique ! Grâce à toi, un jour certainement, j'en ferai un. A classic and favorite pattern. Nice fabric choices for this traditional block. Good luck on your progress. I'm always so drawn to the gorgeous autumnal colours in this quilt Christine, really glad to see it back on the wall! I just love this quilt top! So beautiful! What a beautiful top! Good luck finishing up the last few blocks so you can enjoy quilting that lovely top. I love these blocks! Reminded me that I have a UFO that is similar... somewhere! Oh that is so pretty. You must finish it! Love the simplicity of these blocks! The fabrics are wonderful too! I am sure once you start you will enjoy finishing it! Dazzling...I love your choice of colors...Happy end...I stay tuned! The quilt top is so lovely with the soft colors that blend so well. The brown works in there well. I'm sure you'll be glad when this is finally finished. I like the pattern a lot and you have chosen lovely colours for it. I have always intended making that quilt Christine. Perfect for all those scraps we tend to collect. Yours is a lovely example! Love this one --- more four blocks you can do it! How about making one block for every two or three rows of knitting completed? Then it can go on the "To Be Quilted" pile -- for next year. I too love this one and am so glad you got her out to finish. Isn't it funny how we run out of inspiration sometimes so close to the end of a project? Glad you shared that with us....as sometimes, we think we are alone in that. Looking forward to seeing her finished.